Taiwan elections: what does the result mean for trade? It’s been 67 years since Taiwan separated from China and relations since have often been defined by mutual animosity. China still lays claim to Taiwan, which it considers a rogue province. With no peace treaty ever having been signed, the countries are technically still at war. However, since the turn of the century, economic ties between the two have grown extremely strong, with a series of trade agreements and a warming in political tensions (culminating in a landmark meeting between Chinese President Xi Jinping and outgoing Taiwanese President Ma Ying-Jeou in Singapore last year), leading to a huge rise in bilateral trade. Analysts, then, have been busy speculating what the impact of an opposition victory in this week’s election means for the country’s trade sector. 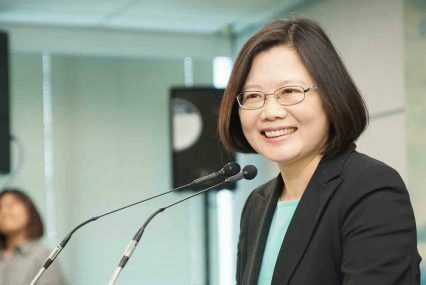 Tsai Ing-wen (pictured) of the Democratic Progressive Party (DPP) swept the presidential election, taking 56% of the votes, while the DPP also triumphed in the legislative election, in a 60% landslide. This gives the DPP absolute power for the first time, with Tsai coming to office on a ticket of greater independence from China. Already, she has promised “more freedom, more democracy, more prosperity and more justice”. Her election came after a period of growing resentment towards what is undoubtedly increased economic dependence on China. But perhaps mindful of how important China has become to the hazardous Taiwanese economy, Tsai has also vowed to maintain the “status quo”. GDP contracted by 1% in the third quarter of 2015. According to Charlie Carré, Asia Economist at insurer Coface, this is due to weakening demand in China – which, Hong Kong included, accounts for 40% of Taiwan’s exports. “China may look to ‘punish’ Taiwan for electing the anti-China DPP by making it more difficult for Taiwan to negotiate free-trade deals with other countries,” Gareth Leather, Capital Economics. China, then, can be perceived as being a threat to Taiwan’s trade economy as well as an opportunity, and Beijing has already sent rhetorical warning shots across the Strait, with government organ Xinhua demanding that Taiwan abandon the “hallucination” of independence in the aftermath of the election result. It’s clear that the Chinese government would have preferred that the Kuomintang (KMT) retained power, given the efforts it made to bolster trade. Since 2008, the KMT signed 23 trade agreements with China, the most notable of which was the Economic Co-operation Framework Agreement (ECFA), signed in 2010. A cooling in relationships is likely to result in a freeze in the progress of such agreements. “Over the last few years, Taipei and Beijing have been able to use the party relations between the KMT and the Chinese Communist Party to make progress in terms of dialogue. This mechanism won’t be available any more if the DPP wins on Saturday. If that happens, new trade agreements probably won’t be negotiated as quickly as they were in the past,” said Johannes Buckow, research assistant at the Mercator Institute for China Studies (Merics) before the election was complete. There may be some impact on Taiwan’s negotiation of trade agreements elsewhere. The DPP leadership has been vocal about wanting to gain entry to existing and future trade agreements, such as the Trans-Pacific Partnership (TPP), which doesn’t include China, and the Regional Comprehensive Economic Partnership (Rcep), which does. As news of the result filtered through, the American Chamber of Commerce in Taipei was urging the country to start preparing to join the second round of membership for the TPP. In a statement, the chamber said it would work closely along with the incoming administration to ensure it meets the criteria for membership. However there is expected to be heavy opposition from the agriculture sector, where there are fears that TPP membership may result in US pork flooding the market. There are also concerns over Taiwan’s ban on the additive ractopamine in pork production, which is widely used in the US. The Rcep is nominally driven by the Asean bloc, but is widely thought of as a Chinese-led agreement. Should Taiwan’s new government pursue an anti-China agenda, membership of this deal, which would account for 40% of global trade, may be in question. “China may look to ‘punish’ Taiwan for electing the anti-China DPP by making it more difficult for Taiwan to negotiate free-trade deals with other countries,” says Gareth Leather of Capital Economics.